Hong Kong Roast Food Express (HKR) is the brainchild of Mary Chan, a self-confessed devotee of the authentic Hong Kong asado. HKR is a fairly new restaurant, having opened its doors to the public only about a month ago. Last monday, I was invited to try out their authentic Hong Kong cuisine for lunch. With me was my friend, Ruth who got left by her flight to Singapore and had a great deal of time to kill before the next flight. It is a long drive from Cavite to the heart of Makati and I was starving when I got to Bagtikan Street. (It was 2:30PM. You can imagine my state.) HKR is a hole-in-the-wall type of restaurant and as with all hole-in-the-walls, I was worried about the parking when I got there. Thankfully, the security guard was very helpful with the parking so we were parked in a jiffy. Parking dilemmas aside, I enjoy hunting down these hole-in-the-wall restaurants. While characteristically small and rather obscure, they reward the seeker with a treasure trove of culinary delights not available anywhere else. There was already quite a spread when we got there, thanks to the early birds we shared the lunch with, but I couldn't resist ordering a couple more. For some reason, I was craving for noodles that day, so I ordered the Sate Beef Noodle (Light- Php115, Heavy- Php185) , that is, in addition to everything else on the table- Salted Baked Chicken (Half- Php310, Whole- 550), Black Chicken Sesame, BBQ Roast Pork a.k.a. Asado (their specialty) (Php180), Sate Beef Hofan (Light- Php160, Heavy- Php240), Roast Chicken (Half- Php195, Whole- Php390), Fried Fish Fillet in Cream Corn (Php150), and Yang Chow Fried Rice (Php110). While I waited for my noodles, famished as I was, I started nibbling on the food already available on the table. I ate quite a lot of the Fried Chicken and the Roast Chicken. Although HKR specializes in roasts, their Fried Chicken deserves just as much praise. 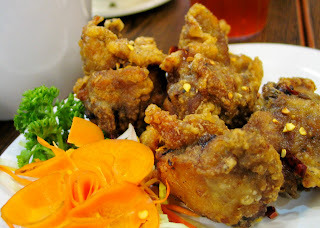 The batter crust was nice and crunchy and the chicken juicy and rich in oriental flavors. And while I do not eat pork, my friend tells me that the Siomai was pretty good, too. Ruth, having lived in Singapore for five years now, tells me that the food at HKR tastes pretty much like the food in Singapore. Singapore's cuisine is heavily influenced by Chinese cuisine and is famous for Hainanese Chicken and satays. 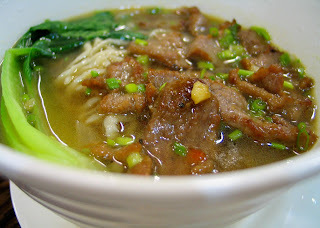 The Sate Beef Noodle really hit the spot for me. The noodles are fresh and the soup it came in is very flavorful. I slurped like a local. And the sate beef has a unique flavor, it definitely is a huge departure from the usual beef, normally braised, noodle I order from other Chinese restaurants. For drinks I had Lemon Tea, HKR's home brew. It was so refreshing, I finished two glasses in one sitting. For dessert, we had Coffee Jelly and French Toast. It was quite a finish for a good heavy meal. 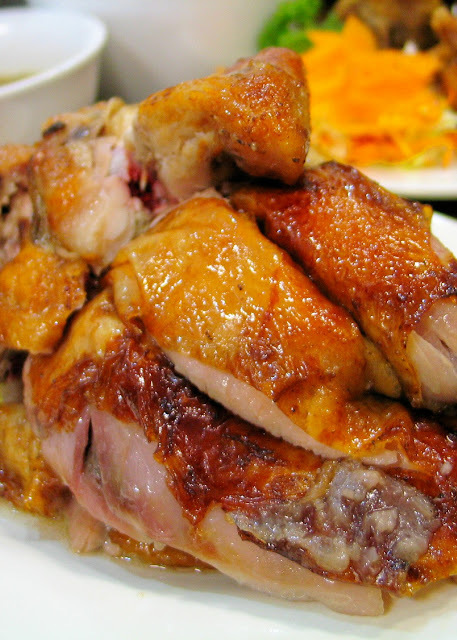 For dine-in and take out, visit Hong Kong Roast Food Express at 7467C Bagtikan St., San Antonio Village, Makati City. For deliveries, contact HKR at (02)553-7846 and (02)984-7760.